NOW available for the first time on CD! June 2004 - ALAB Eddie Hardin's Autobiography now available! Signed copies available through his website! Zak Starkey and Eddie Hardin's musical collaborations date back to Zak's early 1980's studio session days. Zak did quite a bit of sessions at Eddie's studios, both for him and with him for others. This is a project of Eddie's that Zak apparently had a great deal of input. He is noted as co-producer, and has co-writer credits on one track as well. "Zak Starkey, son of Ringo, was my assistant throughout! He would read chapters and remind me of their theme, and the same afternoon I would write a song to compliment this theme. We devoted two very happy years into the creation of the songs..."
Produced by EDDIE HARDIN and ZAK STARKEY. 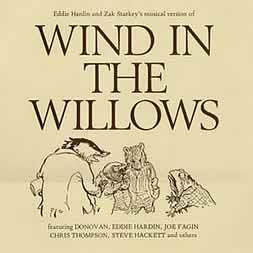 and " Mr. Toad " by EDDIE HARDIN & TONY BARTON. All songs published by D.L.Songs. The "thank you's" seem to indicate that it was recorded at Eddie Hardin's home studio, though it is not mentioned by name. At the time of it's release, it was rumored that many contributors were not "officially listed" to help keep the costs-royalties down. 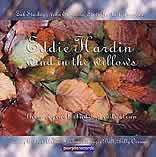 This LP was made available as "Eddie Hardin's Wind In The Willows - A Love Story" privately produced through Eddie's official site in 2000, prior to the Purple Records release, and is no longer available. Purple's list of special guests on the CD (in addition to the ones listed on the original LP cover) include Maggie Bell, Denny Laine And Annie Haslam. It compares the album to the 70's Butterfly Ball project (something that many Deep Purple fans are familiar with) and states that this will be the original studio LP, plus a number of previously unreleased bonus tracks from the studio sessions, an early demo featuring Ian Paice, and two tracks from an all star live performance of the work that feature Jon Lord and Graham Bonnet.